MEMBERS of St Augustine’s Not so Young Club in Downend are setting their sights on new horizons after the success of their first coach holiday. The club ventured to Scotland this year and visited Inverary, Edinburgh, Dunoon and Fort William, as well as taking a cruise on Loch Lomond. 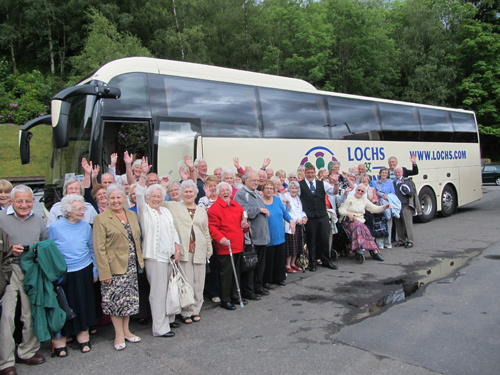 Club member Frank Murphy said some members had been apprehensive about the long coach journey to their hotel at Arrochar on the banks of Loch Long but the 57 travellers had had a wonderful trip. Members had helped the most senior holidaymakers to ensure they all enjoyed the stay. “This, our first holiday venture, proved to be an outstanding success and memorable,” he said. The club is now looking forward to a summer holiday in Yorkshire in 2014. The ‘Not So Young’ Club was formed more than 25 years ago as a friendly monthly get-together. Membership gradually increased and speakers and entertainers were engaged. The club began arranging coach trips and occasional lunches. This autumn starts with a trip to the Royal Botanic Gardens at Kew.